Apparently, we have a problem. So much so that our friends at Marcia Selden Catering thought it’d be awesome to share a new set of recipes with us that feature beer. Yeah, sure, beer is awesome to cook with, but it’s even more fun when you’ve got some extra to drink while you’re cooking. So, our suggestion? Check out Half Full Brewery in Stamford Friday-Sunday, get some growlers, then let loose with these four killer recipes that Marcia Selden Catering created featuring Half Full. Also new at Half Full is their Crowler fill station which is basically a 32 oz. beer in a can that can last for weeks or even months as opposed to a couple of days with a growler fill. 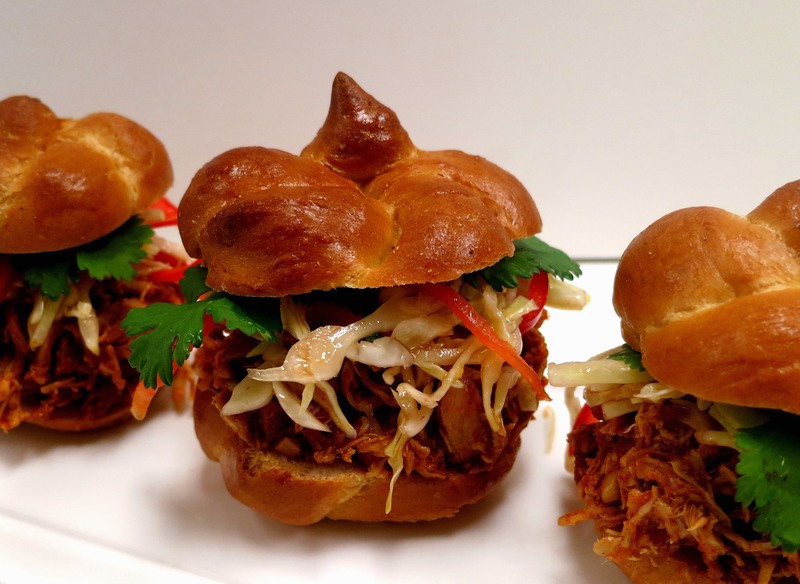 However you get the beer to your kitchen, you’re gonna die for Beer, Bacon and Cheddar Soup, Beer Braised Pulled Chicken Sliders with Spicy Slaw, Korean Crispy Braised Pork Belly with Pickled Onions, and Big Boy Franks and Beans. Let’s do it . . . and thanks again to Marcia Selden Catering for the great recipes! Half Full’s Toasted Amber Ale is the perfect beer for this recipe because its toasted nutty flavor pairs well with the creamy richness of this soup. Brown bacon in a heavy bottomed soup pot over medium high heat. Once bacon has browned, remove from the pot and set on dry paper towels. Add chicken to bacon drippings, stir to combine, and cook for 6-8 minutes until cooked through. Remove and add to another plate. Add butter to pot and stir until melted. Whisk in flour and spices, and add beer, stock and half and half. Stir until thoroughly combined. Add shredded cheese and stir until mixture is smooth. Add Worcestershire, cooked chicken and bacon and simmer on low heat until ready to serve. Ladle into a bowl and garnish with chopped chives and crushed corn chips before serving. Half Full’s Bright Ale is ideal for this dish because its crisp citrusy flavor keeps the sauce light and tangy. Combine brown sugar, garlic, mustard, salt, pepper chipotle, and paprika in a large bowl. Add chicken thighs and let sit for 30 minutes, covered in the refrigerator. In a heavy bottomed (Le Creuset style) pot with a lid, add olive oil, onion and chorizo and cook over medium high heat for 5-6 minutes. Add tomato paste, garlic, and chicken to the pot, stir to combine. Add vinegar and beer to the pot and stir well to combine. Cover and cook in the oven for 40-45 minutes or until chicken comes apart with a fork. Using two forks, pull chicken into shreds. Combine all ingredients in a bowl, cover and refrigerate for at least 1 hour before serving. Cut rolls in half, add shredded chicken and onions and top with a hearty spoonful of slaw before serving. Half Full’s Chocolate Coffee Brown Ale adds a deep almost oaky flavor to this rich marinade for the pork belly. Preheat oven to 325°F degrees. Combine pomegranate juice, beer, chicken stock, soy sauce, oyster sauce and Gochuchang in a bowl. Place pork belly on a foil lined roasting pan. Pour sauce over pork belly and turn to coat. Cover with foil. Cook pork until knife goes through easily, about 1½ hours. Remove from liquid (but keep liquid), let cool, cover and refrigerate pork overnight. Add sauce and honey to a pan and reduce by half over medium high heat. Set aside until ready to use. Preheat oven to broil, slice pork into ½” pieces and place on an aluminum foil lined, greased sheet pan. Brush pork slices with reduced liquid and broil for about 1 minute. 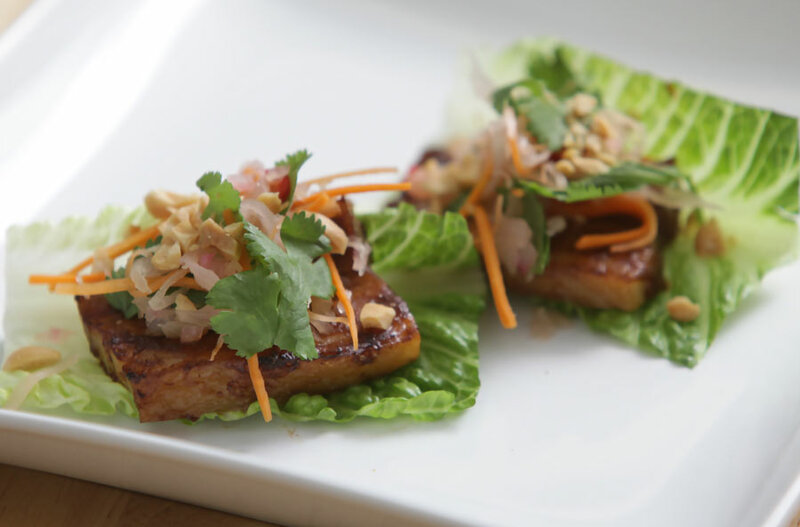 Add a slice of pork to a lettuce leaf cup and garnish with pickled onions before serving. Combine all ingredients in a container with a lid and let sit at least 4 hours, preferably overnight. These will last 2 weeks or longer. You can continue to add onions as needed. Half Full’s Double IPA is the perfect drinking while cooking beer for this dish because its bright flavor pairs beautifully with the kielbasa and brown sugar. Cook the pancetta in a heavy large oven-safe pot over medium heat until crisp, about 6 minutes. Add the onions, garlic and kielbasa, and saute until the onions are soft and kielbasa has browned, about 5 minutes. Add beer, tomato paste, brown sugar, vinegar, molasses, mustard, salt, and pepper. Stir in the beans and bring to a simmer. Cover and bake until the bean mixture is bubbly and has thickened slightly, stirring occasionally, about 45 minutes.